A Jalapeno pepper, native to Mexico that is smoked, dried and most often served as an appetizer or as an ingredient in sauces, salsas, soups, and stews. It is a common chile used for making adobo sauces. Prior to being smoked, this hot pepper has a thick skin that is firm with a uniform green color. 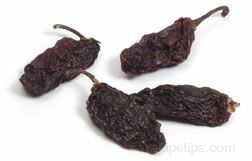 After being smoked, the pepper wrinkles, becomes mildly hot, and turns dark brown in color, providing a smoky sweet, brown sugar flavor with a hint of chocolate.